This article is about the level in Donkey Kong Country 2: Diddy's Kong Quest. For a level in Donkey Kong Land 2 with a similar spelling, see Redhot Ride. 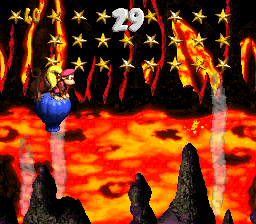 Red-Hot Ride is the ninth level of Donkey Kong Country 2: Diddy's Kong Quest. It is the fourth area of Crocodile Cauldron. This level takes place within a volcano, but unlike in Hot-Head Hop, solid ground is hard to come by. 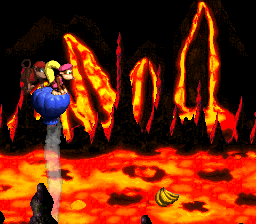 The Kongs must cross wide lakes of lava by riding atop Hot Air Balloons, which are exclusive to this level. The Kongs must be careful as they ride the objects, as the balloons slowly descend towards the lava unless they are on top of the thermals found throughout the level. Rambi the Rhino can also be found in this level and used during the first half it. The enemies in this level include Klomps, Klobbers, Flitters, Krunchas, Zingers, Click-Clacks and Neeks. Dixie hovers under an area of ground that holds Rambi's Animal Crate. When the heroes begin the level, they find themselves outside of a tunnel with a Banana Bunch ahead of it. A raised area of ground is near of here that they can climb to find a Klobber and a wide pit of lava with a Hot Air Balloon suspended by a thermal above it. A group of bananas are to the right of the banana, and they form the shape of an arrow, which points to the right. Once the Kongs cross this pit, they come up to another high piece of land on a solid, rocky area of ground. They can find a Kruncha here, who is followed by a lava pit with two thermals in it. The first of the thermals holds up a balloon that the heroes can ride on to cross the pit, and the letter K is between it and the following thermal. After the primates glide past the second thermal, they reach a Banana Bunch and another area of ground, where they can find a high piece of ground with a Kruncha and an Animal Crate containing Rambi on it. The Kruncha stands on a slightly lower part of the ground than the crate, which sits to the right of a Zinger. If the heroes head east from here, they find a Klobber and a small pit with another Zinger above it. On the other side of this small pit, they can find another Klobber on a flat piece of ground and then another wide pit. 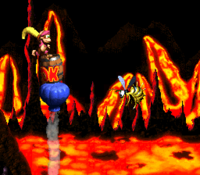 A thermal keeping a Hot Air Balloon suspended in the air is at the beginning of the gap, and the Kongs can ride over the pit if they ride on the balloon. Two thermals are ahead of here to raise the balloon, and a pair of Zingers, one of which that guards a Banana Coin, are between them. If the heroes continue forward from here, they reach another thermal with two Zingers above it. They must pass the thermal quickly to avoid being pushed towards the enemies. Once they pass an additional thermal, they reach a Zinger that flies above the letter O. A thermal is behind the enemy that can push the Hot Air Balloon carrying Kongs into it. Four more thermals are farther ahead of here, and a Zinger and a Banana Bunch are above the second of these thermals. The thermal next to this holds a Hot Air Balloon with a Kruncha on it, who marches under a Banana Coin. An area of land is ahead of these thermals, and it carries a pair of Krunchas and a No Animal Sign. If the primates cross the sign with Rambi, the rhino disappears and they are given a Banana Bunch. On a slightly higher area of ground near here, the primates can find a Click-Clack that walks next to a small pit. On the other side of the pit, the primates can find another large, rocky platform that holds a Kruncha. They can also find the level's Star Barrel above this platform. Dixie and Diddy jump onto a Hot Air Balloon with a DK Barrel on it. To the east of the Star Barrel, the duo can find another wide pit that begins with a thermal holding up a Hot Air Balloon, which supports a DK Barrel. A Zinger is to the right of this thermal, and it is followed by a second thermal. After the heroes pass the columns of heat, they approach a few Flitters that try to fly into them. A small thermal can be found farther ahead of here, and it is followed by a larger thermal that holds up a Hot Air Balloon. This balloon is surrounded by two Zingers, who hover under the letter N and a DK Coin. Once Diddy and Dixie pass another small thermal near here, they reach a Hot Air Balloon that holds a Neek and a TNT Barrel. The balloon is suspended by an additional thermal. They can ride along this balloon or their current balloon to reach another thermal that is located next to a trio of Zingers that the heroes must hover under to pass. They can also defeat some of the Zingers, who guard a Banana Coin, with the nearby TNT Barrel to pass them. On the other side of these Zingers, the primates can find a pair of thermals and a high, rocky platform that holds a Klobber. A Neek marches along a Hot Air Balloon being suspended by a thermal above a pit near here. They can ride the balloon to approach a Flitter, who they can bounce on to reach another balloon on a thermal. They must control the balloon so that it leads them past a Zinger and to another Flitter with a Banana Bunch above it. A Hot Air Balloon slowly descends to the right of the Flitter, as it is not held up by a thermal. The two primates can find another Hot Air Balloon ahead of here that holds a Neek. Before the balloon falls into the lava pit, they must control it so that it hovers above a small thermal nearby. They can find another thermal farther ahead of here with two Zingers next to it. 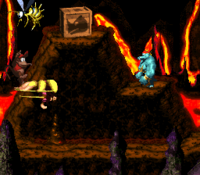 The primates must hover between these foes in order to safely progress to the next part of the pit, where there is another thermal placed under a Golden Feather (an item found exclusively in the Game Boy Advance version of the game). The letter G is near here next to a trio of Zingers who are all positioned above separate thermals. They must head under these foes quickly, as the thermals may push them up into the Zingers if they are too slow. After they pass these Zingers, the heroes approach a thermal next to a Hot Air Balloon that slowly descends towards the lava. They can use this balloon to reach an area of ground with an End of Level Target on it, which they must hit to complete the level. If they hit this target immediately after jumping from the final balloon before descends too much, they win a prize as they finish the level. Shortly before reaching the level's Star Barrel, the heroes can discover two Krunchas and a No Animal Sign. Immediately before this area, they should use Rambi's special move to break a wall open and create a hole. If they enter it, they find themselves in a Bonus Level, where they must defeat five Klomps and three Flitters as they travel through a fiery area. 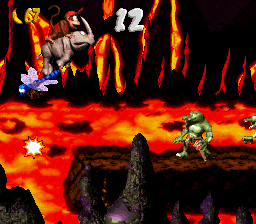 At some points in the bonus, the heroes must bounce on the Flitters in the stage to cross pits. When all of the enemies are bested, a Kremkoin appears at the end of the area. They have 15 seconds to complete this Bonus Level. While under the Star Barrel, Diddy and Dixie will notice a banana under the rocks they are standing on. A Bonus Barrel is hidden under here, and if they hop onto the nearby Hot Air Balloon, it can guide them through the ground area and to the special barrel, which sends them to a Bonus Level when accessed. Here, the Kongs must get onto another balloon and grab 40 stars as they travel above a boiling pit of lava. There are thermals above the lava that can keep the Hot Air Balloon in the air. If all of the stars are collected within the time limit of 30 seconds, a Kremkoin appears to grab before the remaining time runs out. Between two thermals at the second Hot Air Balloon. After Rambi's Animal Crate, located under a Zinger that hovers over a thermal. Over two Zingers that surround a Hot Air Balloon after the Star Barrel. Near three Zingers that fly above some thermals at the end of the level. DK Coin After leaving the stone platform with the Star Barrel on it, the Kongs must travel across some of a pit of lava, until they eventually see two Zingers lined up with a Hot Air Balloon that is located between them. A DK Coin is located above one of these Zingers, and it can be reached with a jump or with the Kongs' Team-up move. Golden Feather (GBA version) This level's Golden Feather is above the thermal located before the letter G, which they can find above the final pit of lava in the level. Photograph (GBA version) A Kruncha with a camera icon over its head marches under the level's Star Barrel. By using their Team-up move, the Kongs can throw one another at the enemy to defeat it. Once the enemy is defeated, the Kongs are given a photograph of a Kruncha for the second page of their scrapbook. A Warp Barrel can be found near the beginning of the level. To find it, the Kongs must head to the second Hot Air Balloon and pass the letter K to reach a thermal. By using their Team-up move here, they can throw one another into the air. If they throw each other in the correct spot in the air, they land in a Warp Barrel that sends them into a Bonus Level, where they can find a group of bananas that form the shape of an exclamation mark. Once they leave the area, they find themselves on a Hot Air Balloon right next to the End of Level Target. The Kong approach a trio of Zingers and the letter in the original version of the level. The Kongs ride on a balloon in the Game Boy Advance version of the level.